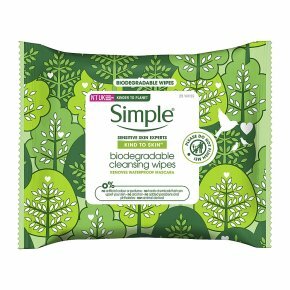 Simple® Kind to Skin Biodegradable Cleansing Wipes gently cleanse the skin of impurities, remove make-up, unclog pores all in the convenience of a facial wipe. Simple wipes leave no greasy residue whilst instantly refreshes and hydrates your face leaving skin feeling fresh and clean. Our Simple® biodegradable face wipe are unscented and contain no artificial perfumes or colours and no harsh chemicals that can upset your skin. Our new Simple® facial wipes are kinder to the planet as they are made with sustainable wood pulp and plant fibres. Suitable for sensitive skin, our biodegradable Makeup Remover Wipes are dermatologically tested and approved. Packed with triple purified water, gentle cleansers and multi-vitamins to lift impurities and make-up. The Simple® face wipes you know and love, now biodegradable. Kinder to planet and yet merciless on makeup - our Simple® Kind to Skin Biodegradable Cleansing Wipes act as a gentle cleanser and an effective make-up remover, even for waterproof mascara. Our new Simple face wipes are kinder to the planet than before as they are made of soft renewable plant fibres and sustainable wood pulp, gentle cleansers, purified water and skin-loving ingredients such as Vitamin B5 and Vitamin E. Our face wipes do not dry out, irritate skin or leave a greasy residue, they're great to use as a makeup remover or part of your daily, day or night cleansing routine. Simple® Face Wipes are unscented and contain no artificial perfumes and no harsh chemicals that can upset your skin, perfect for sensitive skin. They are dermatologically tested and approved, not forgetting hypoallergenic too to care for all sensitive skin types. Your go to makeup wipes are convenient, quick-to-use and make the perfect addition to any makeup bag, gym kit and bathroom to give a gentle cleanse or touch-up for naturally healthy-looking skin every day wherever you are. And what's more, our sensitive skin is left feeling thoroughly clean, fresh and instantly hydrated. For best results and how to apply: cleanse day and night by gently wiping the Simple Kind to Skin Biodegradable Wipes over eyelids, face, neck and even lips to cleanse the skin. Mascara won't budge? Hold the wipe over stubborn areas for a few seconds before wiping. Stop your facial wipes drying out by remembering to reseal the pack. Throw used facial wipes in the bin; do not flush. The environment will be thankful for it. Gently wipe over your face, holding the wipe over stubborn make-up for a few seconds before wiping. Remember to reseal the pack to prevent wipes from drying out. Throw used wipes in the bin, do not flush!